UniCredit is a major international financial institution with an international presence in approximately 50 markets, with about 160,000 employees and 9,500 branches. 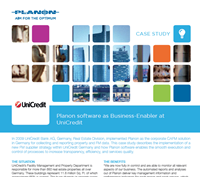 UniCredit benefits from a strong European identity and a broad customer base. UniCredit’s Facility Management and Property Department is responsible for more than 850 real estate properties all over Germany. These buildings represent 11.8 million square feet of space which approximate 65% is owned. The great diversity in property types, sizes, age, and conditions creates enormous challenges for how the facility management team is organized and operated.